Rada MP and Right Sector Leader Dmitri Yarosh told Ukrainian media to expect a third Maidan revolution, and claimed that it would be bloodier than before, given that the country's growingly impatient young revolutionaries are now heavily armed. In a recently released excerpt from his Sunday interview with Ukrainian newspaper Obozrevatel, MP, militant activist and Right Sector Leader Dmitri Yarosh noted that if a third Maidan were to take place in Ukraine, it would be bloodier and more terrible than anything ever witnessed before it. "In Ukraine, everything is possible, a new Maidan all the more so. People have dignity. 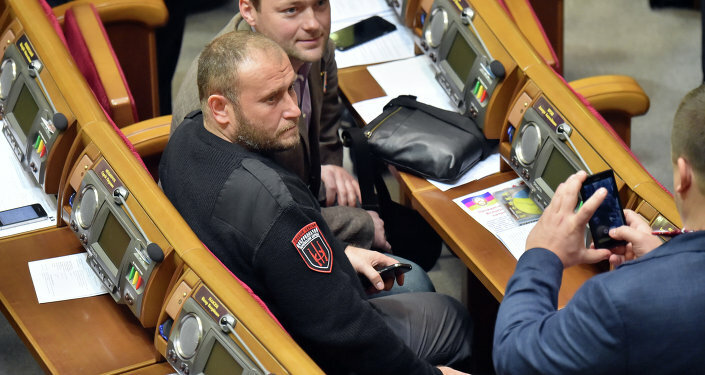 And when they are pushed to the limit, they come out for new Maidans," Yarosh stated. "Of course, the next one will be, let's say, different. People are so heavily armed now that no one is going to sit in tents and wait for a month or two, singing songs or waving flashlights. And this is just something that we don't need," the radical parliamentarian added. "Our position is that we must walk on a knife's edge. On the one hand we must maintain the state, but on the other, we must make it so that parasites do not drink the blood of the Ukrainian people, as they did before the revolution," Yarosh added. "We have among us radicals, who are already shouting 'let's do it now!' Especially the youth, which has taken a breath of this spirit of freedom, and now they are ready, at a moment's notice, to take the parliament, the presidential administration, to kick everyone out of there. We are trying to explain to them that in such a case we would lose our state, and that Putin would immediately send his troops to Kiev, to save the country from the worst kind of junta. Because this 'juntlet' we have now is relatively sweet, and not very scary, compared to the most bloodthirsty Banderites. Therefore even this process must be tempered. 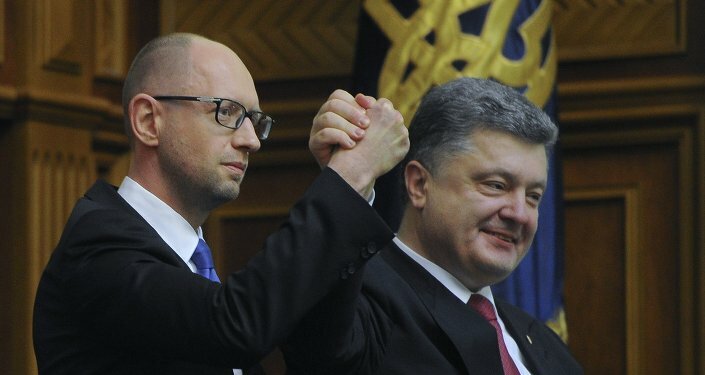 Whether I am correct or not only time will tell," the Right Sector leader noted. In a separate interview published Sunday on Ukrainian news site LB.ua, Yarosh noted that Ukrainian President Petro Poroshenko "still does not understand what country he lives in, and the underlying realities" of his position. Voicing his disagreement with Poroshenko's decision to sign the ceasefire agreement in eastern Ukraine last month, Yarosh noted that "our politicians, who became statesmen at the cost of blood spilled on the Maidan and in this war, are far too dependent on the opinions of those from abroad." The militant noted that shortly after the signing of the ceasefire, he called up an aide to the president and told him to warn Poroshenko that "we removed Yanukovych, and we can remove him too." The Right Sector is a far-right wing Ukrainian nationalist party and militant formation. In January and February of 2014, the movement's members participated heavily in fighting with Ukrainian police in the streets of Kiev, and in the capture of government buildings during the Euro-Maidan coup. Since April, they have also been involved in Kiev's military operation in Donbas. The Right Sector's Ukrainian Volunteer Corps includes two battalions operating in eastern Ukraine, as well as eight reserve battalions throughout the rest of the country. In November 2014, the Russian Supreme Court declared the Right Sector to be an extremist organization, and its activity has been banned on the territory of the Russian Federation. Earlier, in March, 2014, Russian authorities issued a warrant for Yarosh's arrest for incitement of terrorism, and for his organization's combat operations in the First Chechen War against the Russian military.